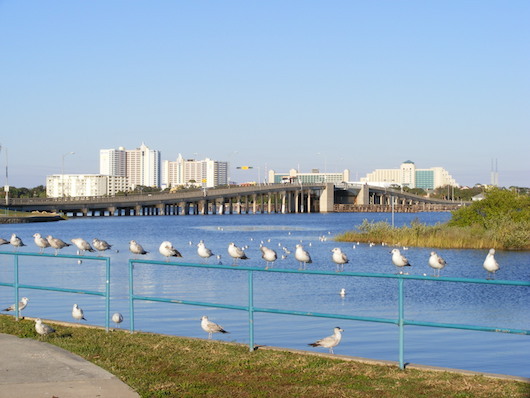 This is a very pretty run, exploring some of the historic sections of Daytona Beach and some waterfront roads around the Halifax River and Marina. Start by exploring the Seabreeze and Surfside Historic Districts between Glenview Blvd. and Main St. for 1 mile, on nice streets with interesting buildings. Then cross the river on the Main St. Bridge. Turn LEFT, heading south along waterfront paths (Juan Ave., Mullally St.), then doing a loop around City Island (Library, Courthouse, Convention Center). You add another mile with a jaunt around the Halifax Harbor Marina. Then turn back heading north, on S. Beach St. and then the paths along the river, for 0.5 miles to E. International Speedway Blvd., where you’ll cross the river on this 0.5 mile long causeway. There are good views and a decent sidewalk (though the road is busy). Length Options: Can be shortened by ~1 mile by eliminating Halifax Harbor Marina. Can add by heading down to the Main St. Pier in Daytona Beach, and enjoying some beach running. Downtown Daytona Beach - Riverview Blvd.